Posted by dan bertolet on	Sunday, December 13th, 2009 at 11:19 am. You can follow any responses to this entry through the RSS 2.0 feed. You can leave a response, or trackback from your own site. 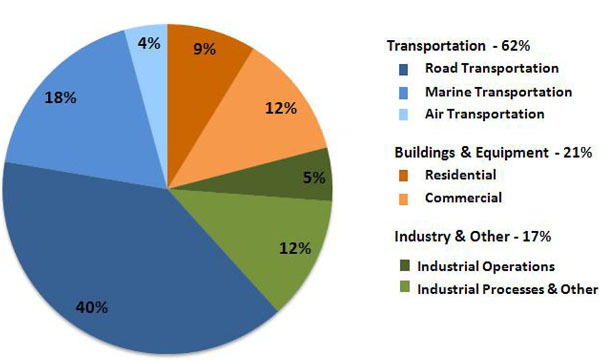 The percentages of GHG emissions for ‘air’ and ‘marine/rail’ appeared to be switched either in Table 1 or in the pie chart and graph. Thanks Dan for outlining the missing elements in the equation. I think your right on regarding the deeper issues of embodied energy, habitat loss and our hugely impactful diet. We have shown good progress, especially since the cities population has grown in this period. Maybe the metric should be defined per person rather than as a city total. But before we start patting ourselves on the back these deeper issues should be accounted for along with true commute driving patterns…doing all this regionally would tell us more and it would likely not look so pretty. It’s also nice to see that the “buildings create over 40%…” myth many eager architects like to proclaim is represented here as 21%. That is still a lot and architects/buildings still have a huge role to play in shaping more compact, transit supported and complete walkable communities. I wonder if our mild climate and our aggressive energy codes helped bring that number down against a national average? RE Comment #1 by Wells above regarding Streetcars: Don’t forget ee have a fully funded streetcar for 1st Hill about ready to build. Leveraging that investment a bit further would be a good idea by connecting the new line to the existing SLU line via 1st Avenue and Stewart Street. It could be the salvation of Pioneer Square. Streetcars, LRT, BRT, trolley buses and bike/ped system improvements should all be dancing together as important players with different roles in this unfolding, less car dominant, drama. Well Dr Density, I agree the transit modes should work together, but whoever is pulling Metro’s strings lately wants all the overhead trolleybus wire removed, starting with 1st Ave. The SLU Streetcar should reach near Pike Place Market to improve ridership, but I’ve always figured running one track westbound on Seneca to either 1st or 2nd Ave and then returning on Pike and 6th would best serve the Westlake Mall area. What about that oversight, Dan? The figures are screwed up backwards somewhere. Given the subtotals, etc. in the table, the pie chart has the error (unless the numbers are really fubar). @3 and @4, yes the pie chart has the error – the air and rail labels are switched. I copied the charts out of the City’s report. @2: 40% is no myth — that’s the typical average for the U.S. The main reason it is lower in Seattle is because of our low-carbon electricity, not because our buildings are that much more efficient than any other city’s. The same effect makes the relative size of industrial pie slice smaller too. This link is to Greg Nickels ridiculously disappointing op/ed in the Times about reducing CO2 emissions. He just doesn’t get it or something. Who knows what he’s really up to? – no good if you ask me. All the interconnectedness makes my head come close to exploding, but I can’t help notice that the flip side of the bedroom suburb is the lack of residential development in urban centers. Taking the long view, Blume and Clise with their “Easy access to I-5″ are looking nearly as bad as BIAW. Click here for a live feed to the public of the STEORN over-unity device demonstration – which started today and will run continually for six weeks. and here for their website. Funny. I doubt the Copenhagan ministers will be discussing this revolutionary free energy device at their meetings, as the whole point of the conference is to raise oil prices, gauge consumers and producers through a new set of multi-billion revenue taxes that will, privilege the few at the expense of the many, create a broad new derivatives market that Wall Street bankers can exploit on the backs of the public, and decimate third and fourth world countries through punitive taxes and rigid development criteria they cannot possibly meet. Way to go, Copenhagan! Dan mentions how Seattle’s inventory doesn’t include the embodied emissions associated with food, consumer products, and buildings. 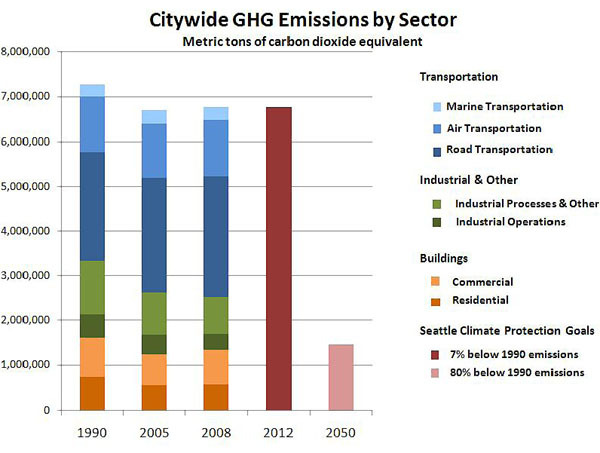 These are indeed big sources of emissions that Seattle residents are partly (if not entirely) responsible for — at least as big as the “official” inventory of 4 million tons CO2e. As a first order approximation of some of these categories, I ran some numbers based on consumer spending data for the region (from the federal BLS), life-cycle emissions studies (from Carnegie Mellon’s eiolca.net), and Seattle’s population, and came up with about 2.7 million tons CO2e for producing and transporting food to us, 1.2 million tons for household furnishings, 0.8 tons for apparel, and 0.4 million tons for new motor vehicles. * Together these add to 4.1 million tons, nearly as big as Seattle’s official GHG inventory, and nearly all of these emissions occur outside of Seattle’s city limits, most of them outside the state, and a good bit outside the country. As to Dan’s point about “locavore vegetarians” — meat is indeed a big source of food-related emissions (the biggest single category in the 2.7 million ton estimate above), but transportation — a source of emissions often cited as a reason to eat local — is only about 10% of food’s life-cycle emissions. (The exception is food that is air-freighted here – air freight is very emissions intensive) By contrast, the big sources of food’s life-cycle emissions are in producing it (e.g., emissions from fertilizers, energy used in growing or processing), and so, for example, highly emissions intensive local food (e.g., that grown in heated greenhouses in winter or highly processed) may be more emissions intensive than, say, vegetables from California. *The numbers I quote here are from a study I worked on last year for the City Council. Oops, in my previous comment I referenced total official emissions of 4 million tons CO2e. I was thinking too early in the morning! 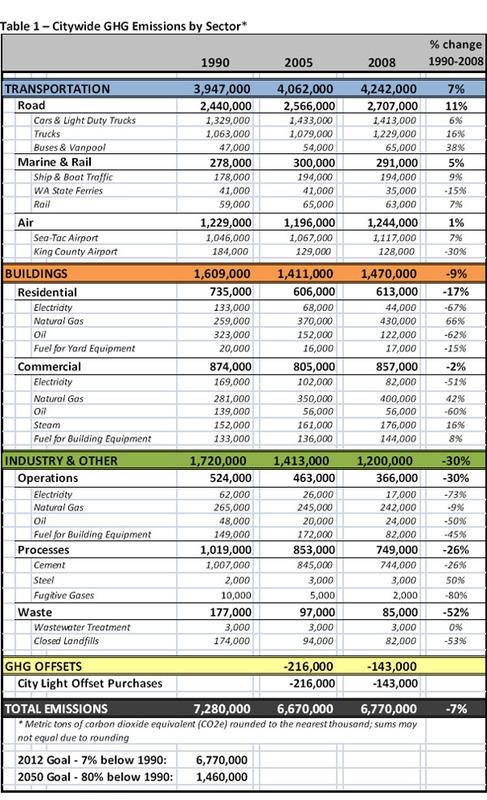 That was only the transportation emissions total inventory (as in the table above) is more like 7 million tons CO2e. Wonderful to be visiting your blog again, it has been months for me. Well this article that i’ve been waited for so long. I require this article to complete my assignment in the college, and it has exact same topic with your article. Thanks, amazing share. I haven`t read your blog for a months until today, another great article, thanks. Steps must immediately be taken to increase sustainability throughout the globe. The numbers of national disasters and world-wide environmental crises are rapidly increasing. In May 2009, the Paraguan government declared a state of emergency after a severe drought left approximately 185,000 people without the basic necessities for life. Paraguay has partnered with IEDRO, the nonprofit International Environmental Data Rescue Organization, to rescue historic weather records from 31 Paraguan observation sites. The inventory represents tens of thousands of crucial observations researchers can study to help prevent and prepare for these kinds of environmental catastrophes, as well as contribute to sustainability studies for the country, from crop planning applications to calculations for potential water collection. Because we run our city on hydroelectricity and live in a mild climate, Seattle’s biggest problem is cars. Cars and trucks are the largest source of our greenhouse gas emissions. Our city’s auto-dependence is often treated as a fact of nature by older commentators, and when they acknowledge the problem of auto emissions at all, they tend to claim electric cars will fix the problem. Unfortunately, electric cars won’t solve auto emissions, and won’t even come close to solving the massive non-tailpipe auto-related emissions that come from road building and other auto infrastructure, air- and water-pollution, increased health care costs and so on. Here’s a thought on assigning carbon and other GHG emissions to transportation. 30% of all cement produced was used to construct roads. Yet, cement production falls into the industry category. And all those diesel and diesel electric pieces of equipment that are used to build and maintain roads also fall in to the industry category. I believe that these categories are very misleading and under-represent the transportation impact. Consider this: if we reduce VMT, we will reduce the need for new roads and road maintenance. This is a multiplier effect that good transportation policy could have. Now a bigger critique. We should be measuring the phenomenon from both a supply and demand perspective. If we offshore the production of steel, our carbon footprint goes down. If we consume that steel locally, though, we should account for the embodied carbon and energy, etc. in our impacts. How unfair is it for us to offshore production of energy intensive manufacturing while we move to an ‘information economy’ (which, BTW, is more energy intensive than most think) and then turn around and accuse China of polluting the commons while serving our consumption patterns. carbon footprints should be measured by consumption not production. Well when you will make Money with Online Poker you have to Learn it. interesting article.. I like your point of view on this subject. Although there are a couple points I deviate on I think you did a good job purposing your view. GJ. Una din pensiunile care imi plac cu adevarat. Through my observation, shopping for electronic products online can for sure be expensive, nonetheless there are some tricks and tips that you can use to acquire the best deals. There are constantly ways to locate discount promotions that could help to make one to buy the best electronic products products at the smallest prices. Interesting blog post.